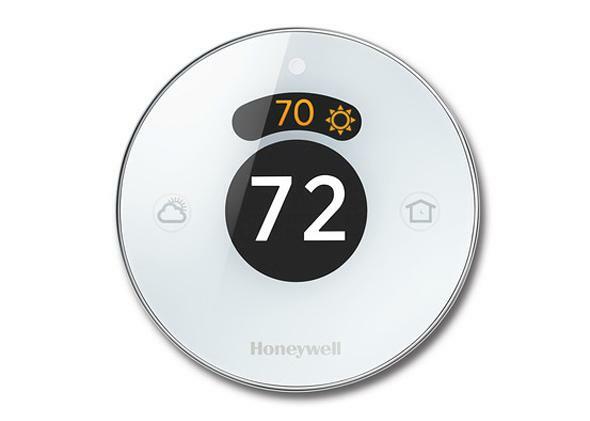 Honeywell's Lyric smart thermostat rivals Google’s Nest. The Lyric thermostat awaits instructions. Over the past few years, Nest hasn’t been the only smart thermostat available, but it has certainly seemed like it. Nest was more obviously designed with the Internet of Things in mind and looked sleeker than the competition, so it seemed like the only snazzy choice. But Honeywell has been making networked thermostats for years, and its new Lyric thermostat has the futuristic look to be a real Nest competitor. It’s currently a challenge to manage a totally connected home because of all the separate apps and interfaces you have to deal with. It’s a problem that companies like Apple are currently trying to fix. But it’s still important to have choices when choosing smart home products to make sure you get the features and privacy options that you want. The more smart thermostats there are on the market, the better they will all have to be to compete with one another. Lyric takes minimalist cues from Nest with a round console that is dominated by a display. The unit has a proximity sensor and glows when you’re walking up to or using it. It shows the current temperature in your house, the goal temperature the thermostat is currently set to, and things like a weather forecast, to help you decide what your next heating move is going to be. The whole round unit is a dial for physically adjusting the temperature setting, but there’s also the Lyric iOS and Android app, of course, for changing the temperature remotely. You can establish presets within the app that change the thermostat to different setting configurations, and you can also use GPS geofencing so the thermostat changes to a certain temperature when your phone moves into a particular area. In another nifty feature, Lyric keeps tabs on your furnace and alerts you if it needs a new filter or other servicing. The point Honeywell is trying to emphasize is that a thermostat shouldn’t try to “learn” what you like—life is so variable that that’s basically impossible. Instead, a thermostat should be able to commune with you and be in sync with your desires, rather than presuming that it knows what you want based on previous behavior. Lyrics are currently available through approved contractors and will begin retailing in August for $279. The battle for a spot in your home is heating up.